“Handel’s Messiah is alive and well” is the caption on this image of composer Georg Frideric Handel, to which we’ve added a smaller subtext, saying: “and the oratorio is pretty awesome, too!” This reminds us all about Whom this great masterpiece was written, and makes a great gift for that special Christian musician, music minister, choir director, or church organist. Additionally, Handel fans may also like some of our other designs, one with a portrait and another with a famous quotation about him! 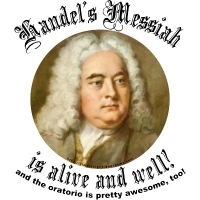 Buy this Handel’s Messiah design now on any t-shirt, hoodie, tote bag, mousepad, mug or other quality giftware and apparel, exclusively from GearGems!